The BHPA Speed Flying training regime followed by Flying Fever is a training syllabus in development, and you will be taking part in a trial training course. We are one of a few Specialist BHPA schools undertaking this training development. This course if for total beginners interested in learning to use speed flying as a way to descend a mountain. 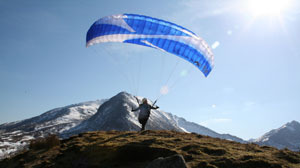 We also do conversion training for existing qualified paragliding pilots. If you want to soar in a speed or mini wing then you have to do your full Elementary Pilot and Club Pilot course as there is a lot more risk of accident potential whilst turning near a hill due to the greater pendulum on a speed wing mixed with a high speed descent close to the hill. The training course starts with the normal size paragliders as they are easier to handle and basically follows the Elementary pilot syllabus - If you are interested you can get your BHPA elementary paraglider pilot rating at the same time as working towards your speed riding certificate whilst doing this course. Arran is an ideal place to learn to speed ride in the right conditions it is great fun and extends the opportunity to fly in Scotland. We train with normal size paragliders and mini wings. The course costs £105 per day and normally takes 5 to 8 days to complete. Plus your BHPA membership. If you prefer you can pay for the 5 day course £525 then pay the extra days that you need.